dessert recipes Archives - THE OLIVE BLOGGER - Recipes your family will love! Now that you know how to make a crepe (from last weeks post) I thought I would share with you how to turn that talent of yours into a delicious dessert that you can enjoy for any special occasion! This Orange Cream Crepe Cake combines creamy ricotta with fresh orange juice and zest and is drizzled with chocolate, which makes it perfect for anytime of year, and a great last minute dessert idea if you are still trying to figure out what to bring to Thanksgiving. Look at how gorgeous it is, especially with the easy to make candied oranges on top. The nice thing with this crepe cake is that you can make it as rich as you would like. You can simply add more layers (we did about 15 crepes) or try adding more chocolate drizzle between the layers. Play with it and have fun! Now follow along with the steps to make your perfect crepe cake below (photo step-by-step below recipe). Prepare whipping cream by mixing 1c on high speed in your mixer until peaks form, scoop out and place in a covered bowl in the fridge. Combine ricotta with orange juice, zest and sugar on medium speed in your stand mixer. Once combined, gently fold in your whipped cream you prepared earlier. Begin by placing a crepe on a cake stand, add a dollop of your orange cream and gently spread out, leaving 1/2" gap around crepe. If desired you can drizzle chocolate on each layer (or only the top). For your final crepe spread cream mixture right to the edges. Drizzle with chocolate and top with candied oranges. Place in fridge to chill (at least 2 hours, overnight is best) and serve cold. You can assemble the cake, including the top layer, a day in advance. Keep in fridge and take out when ready to serve. Your crepes and candied oranges should already be done at this point, this is for your day of assembly of the cake. 3. Save yourself some fussing and put your cake plate on a lazy-susan to make it easy for your cream. Start by putting a crepe on your cake stand and a dollop of cream (approx. 1/8c). Using an offset spatula gently spread the cream on the crepe, stopping 1/2″ from the edge (the cream will spread to the edges as the weight of the layers are added on). If you want it more decadent, drizzle melted semi-sweet chocolate between each layer. 4. Place your next crepe on top and gently press down, repeat step 3 until you have the height you desire (we used approximately 15). When you get to your final crepe you can cover in plastic wrap and place in the fridge (at least 2 hours to chill) overnight is better as it allows the cream to settle. 5. Finishing touches! Fully cover your final layer with your orange cream and take it right to the edges. Drizzle with melted semi-sweet chocolate and then top with your candied oranges. Enjoy! How easy was that?! Seriously, if you show up with this to your next family dinner everyone is going to think you are a dessert goddess!! They don’t need to know how simple it was to make, all they are going to care about is the luscious orange cream mixed with the richness of that chocolate! Mother’s Day and warmer days are ahead my friends, which means it is time to start adding some new and tasty desserts to your recipe box! This Lemon Amaretto Tiramisu is a real game changer, in fact it is so delicious that I think you will be making it over and over again this summer! This Tiramisu is super light and fresh tasting, and the addition of the lemon curd is seriously amazing…it gives it that nice tart punch you crave on the hot summer days (think of a delicious glass of lemonade puckering your lips). This Lemon Amaretto Tiramisu is super light and fresh tasting, and the addition of the lemon curd is seriously amazing! The cookies are dipped in a simple syrup created with Amaretto perfectly pairing with the sweetness of the mascarpone layer. In a traditional Tiramisu the cookies are first soaked in espresso and coffee flavored liquor, which many people find overpowering and heavy. This one however is instead dipped in a simple syrup created with Amaretto (which is a lovely almond flavored liquor) and perfectly compliments the sweetness of the mascarpone layer. Heavenly right?! There are a few steps for making the dessert, but it really comes together quickly once you have everything going, and trust me when I say the time it takes to make it is more than the time it will take for you to devour it! Preheat oven to 350 F . Beat the egg white in a small bowl and toss almonds until well coated. Stir in 1/4 cup of the granulated sugar until well combined. Spread onto either parchment lined baking sheet, or a silicone mat (see photos). Bake and stir after about 5 minutes, place back into the oven until light golden, about 5 mins. Set aside. Prepare lemon curd according to package, allow to cool slightly and add in the cool whip. Stir until well combined (should be a soft yellow). Place in the fridge until ready to assemble (can make a day in advance). In stand mixerl, beat together mascarpone, icing sugar and vanilla until smooth. Empty into bowl so you can prepare whipped cream. Beat 1-1/2 cups of the cream until stiff peaks form; fold into mascarpone mixture using a silicone spatula and put in fridge until ready to assemble. In small pot cook remaining granulated sugar (1/4 c) with 1/4 cup water over medium heat and stir constantly until sugar is dissolved. Remove from heat and let cool completely. Stir in amaretto. Dip both sides of ladyfinger cookies in amaretto mixture and place in a single layer in a 13x9" baking dish. Spoon mascarpone mixture over ladyfingers, spreading to edges gently pressing down so mixture fills holes. Spread lemon mixture evenly over top. Prepare the rest of the whipped cream and spread over lemon mixture, top with almonds and serve. Prepare the lemon curd and mascarpone mixture a day in advance so you just have to assemble the dish when you want it. Going to multiple events in a weekend?? No problem! This recipe can easily make two 8″x8″ dishes instead (your layers won’t be as thick but will be JUST as tasty). Put your sugar water mix in the fridge once it comes off the stove to cool it down faster! Be sure to soak your cookies long enough (about 10 seconds a side) you want them to be soft with a slight bite to them (plus the more amaretto mix they soak up the better). This recipe was adapted from Canadian Living. Microwave Mug Cake Recipes – Salted Caramel and Chocolate Brownie! Oooo do I have a TREAT in store for you guys today! If you enjoy indulging in a slice of chocolate cake every once in awhile, but just don’t have the time or patience to make it, don’t you worry…your newest and QUICKEST recipe is here : Microwave Mug Cakes!! These tasty desserts seem to be growing in popularity, and for really good reason if you ask me! The Mug Cake Recipes that I have for you guys are awesome for a few reasons; they take under 5 minutes from start to finish (yep that includes cooking time), they use ingredients that you already have on hand, and they are just simply DELICIOUS ! Guys, don’t just take my word for it…look at them! Updated from original February 2017 version. Last updated November 2018. 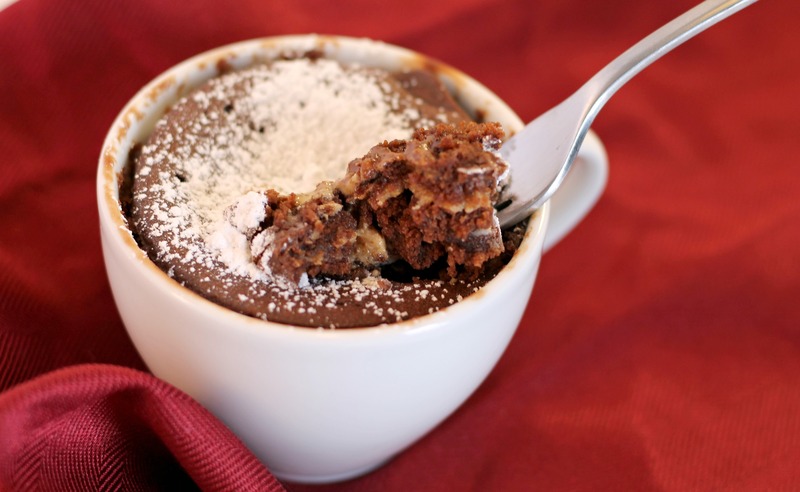 This is the Chocolate Brownie Mug Cake (with a gooey peanut butter middle!). Find the recipe for this and the Caramel Mug Cake below! The quickest and most delicious dessert you can make in under 5 minutes! These Mug Cake Recipes feature chocolate, peanut butter and salted caramel! 2 tbsp Butter Melted, cooled. Heat milk and melt butter, set aside. In small bowl sift together flour, baking powder, cocoa powder, and sugar. For Caramel Mug Cake: add in 1 tsp caramel sauce, milk and butter. Mix well until there are no clumps. Mix in chocolate chips. Pour half of mixture in mug, add additional 1 tsp caramel sauce and top with the rest of batter. Microwave on high for 1 minute, drizzle with remainder of caramel and sprinkle with salt. For Chocolate Brownie Mug Cake: Steps 1 and 2 above, then add in milk and butter mixing until no clumps. Add in chocolate chips. Pour batter into mug. Gently form peanut butter into log using two spoons and push into the center of batter. Microwave on high for 1 minute. Top with icing sugar if desired! Your mug cake may look a little "wet" around the edges when it comes out of the microwave, and that is PERFECT! You do not want to overcook it which will cause it to be dry! Did you even finish reading the recipe before you started to gather your ingredients (ha!) I don’t blame you, they are super easy to make and really will curb any sweet tooth you have! Another thing I love about any Mug Cake recipes is that you can really customize it to your own tastes. As long as you have your basic ingredients (flour, sugar, baking powder, milk, butter) you can really get creative and add in things that you love! Why not try a chocolate coconut mug cake? Or how about a peanut butter and jelly mug cake?! The possibilities are really endless! Here are just a few of the questions we get about our mug cakes. If you have any questions or suggestions for new flavors be sure to let us know with a comment below! how do you make a perfect mug cake? 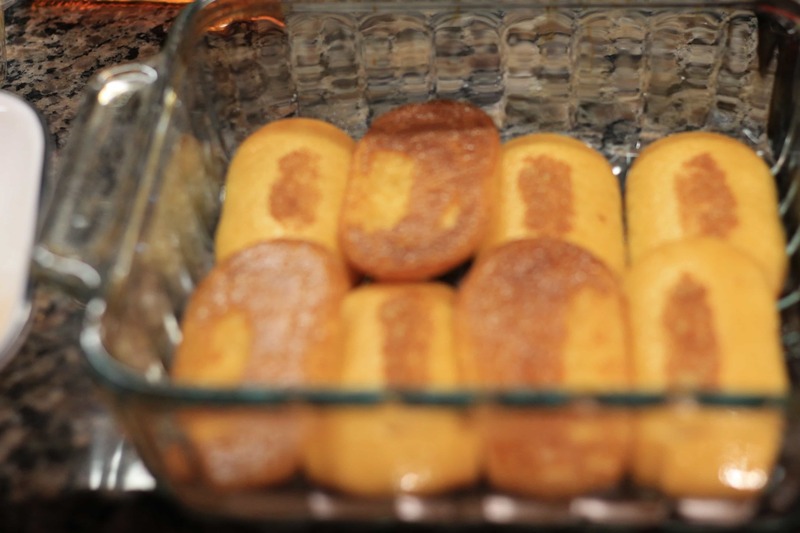 Measure out your ingredients, you don’t want to “eyeball” your baking powder and have a flat microwave cake. Do not over-mix your batter. We like to mix our melted butter and warmed milk together before adding to the dry ingredients so there is less stirring to combine them. Pay attention to your microwave power level, you don’t want to have it set too low or too high as this will affect the outcome of your cake. Try to have it set to 70-80% power for the best results! Make sure you don’t go longer than the suggested time. The mug cake may look a little “wet” when it comes out of the microwave but it does keep cooking once you take it out. YES! That’s the short answer! They are perfectly moist, deliciously sweet and can be customized to your tastes easier than a full sized cake. Whether your are in the mood for a Caramel Mug Cake, Chocolate, Strawberry, Carrot or even Banana Mug Cake, the possibilities really are endless. They are a quick and easy individually sized dessert that can be made any time. Perfect portions for late night cravings and midday pick-me-ups. Because they are so easy to make, mug cakes gain extra points in my books. Anything that can satisfy my sweet tooth that only takes 5 minutes is a win-win. looking for more sweet treats?! Check out this delicious Monkey Bread from our friends at FizlDizl! Want a new muffin recipe?! Try our Coconut Carrot Muffins! Two Minute Mug Cake Recipes! Features a Salted Caramel Mug Cake AND a Chocolate Brownie Mug Cake with a Ooey Peanut Butter middle! Your new go-to dessert any night of the week! I am gonna just start by saying that these Nutella Brownies are the BEST brownies you will ever make!!! And I do not say that lightly friends. As you know I am a major chocoholic and brownies may as well be listed as a food group for me. As part of this months Blogger Recipe Swap that I participate in I was tasked with making something from Aileen Cooks (you guys gotta check her out!). I had so much trouble finding just ONE thing to make but as soon as I saw her Nutella Brownies I was done…heart stopped, drool running down my face, done. I mean can you blame me…look at them!!! Just looking at that giant plate of goodness makes me want more…sadly we brought them all to a dinner party with friends and they were DEVOURED which meant no leftovers for us! But hey that’s okay, just means I get to make another batch…just for me…for me and my hubby of course! 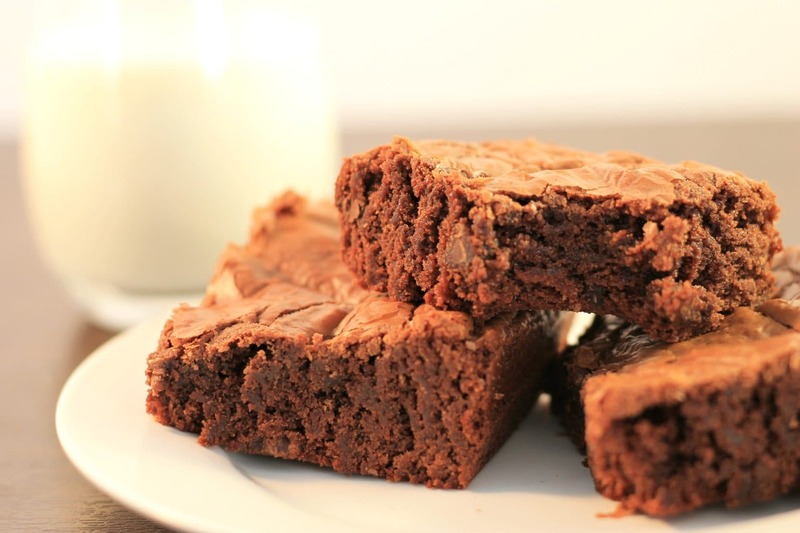 These Nutella Brownies are the BEST brownies you will ever make! Perfectly chocolaty and full of Nutella flavor, with the perfect gooey-ness in every bite! Preheat oven to 325 degrees. Grease a square 8x8 baking dish and set aside. Combine Nutella, eggs, and vanilla in stand mixer until well combined. In a small bowl, sift together the flour, salt, and baking soda. Fold the dry ingredients into the Nutella mixture until JUST combined. Add in the chocolate chips and gently mix in. Pour the brownie batter into the greased baking dish and bake 22-25 minutes. looking for more treats like these nutella brownies? Be sure to check out the original recipe and many other yummy eats over at Aileen Cooks!